I politely told him he needed to go home because it was already night-time, but then I found out he was a street kid. He had no home to go too. So, that night we welcomed Din into our Imparting Smiles family. He was the first street kid I ever spent time with and quickly I found out about his rough character; later I discovered, much his character he has in common with other street kids. First, he is tough as nails. He may feel pain, but he doesn’t show it. I’ve never seen him cry. He came with a gaping leg infection that took six months to heal and never complained. Secondly, he has never heard the word “no” in his life, so he just does what he wants to do. Thirdly, he is very expressive and loves to have fun. (Especially if it hurts someone else, or makes them cry.) He usually, just doesn’t know when to calm down either. Fourthly, he has never really known love and he is starved for any he can get. 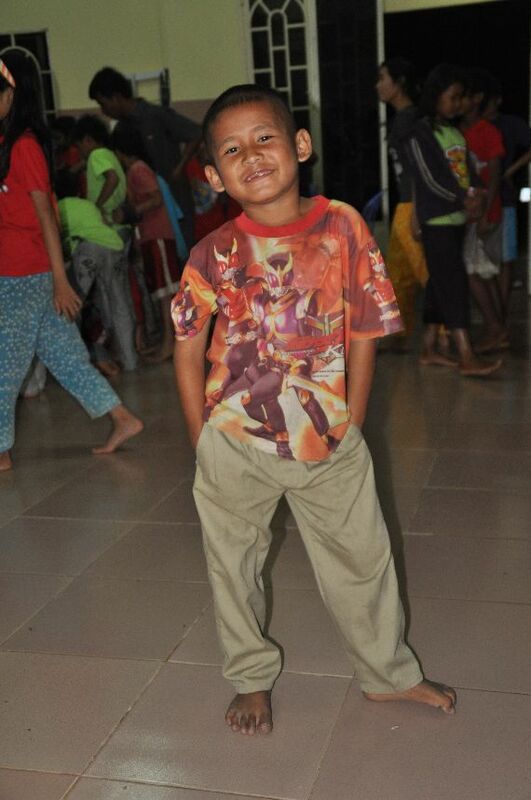 Of all the kids in the Poipet center, Din is the one I think about the most. Everyone has a different experience with him. He liked Heidi and loves to read books with her. He loved to punch Dan. . . and Din punches about waist high! Christine has trouble getting him to listen and pay attention in English class. Our directors get frustrated because he regularly leaves his school books at school and nearly every week he loses a pair of shoes, probably because he never wore any for years. But I think everyone has fun with him too. I think Din broke our record of the number of times anyone ever ran away. I think he ran away 3-4 times this year. We know where his “safe places” are and there are a couple of families in the village that used to feed him and will let us know where he is. However, last week he ran away again. Why? Because we told him “no”. After a week on the road, he peeked through the fence of the center. Eventually, he came back inside. The last two days I wanted to spend some quality time with him. We wrestled; he always sat on my lap and read books. As we talked, laughed and just had some bonding time, he told me about being put in prison by the police in Thailand. He is a little boy. I can’t imagine what horrors he has been though in his short life, but I hope he will never have to face these kinds of things again. As I reflect back on the last year with Din, I am grateful that God has given me the best job in the world. Loving broken people is hugely rewarding. Din has come a long way in the last year and in ten years he is going to be an amazing young man! Thanks for sharing Din’s story, Steve. When I was at Imparting Smiles a couple of months ago, Din was there and followed me around like a little shadow. It really helps to know his story. Thanks for providing a safe haven for Din and so many other kids in need. Have a blessed Christmas and may 2012 be a great year for you and your family. Thanks for sharing the story of “tough” little Din. I just now prayed for him. I’m so glad he can experience the love of Jesus through you and those serving with you there. Thanks so much for all you do to bless children! Merry Christmas! Love to Noit! Thanks for making me cry Steve! God is sooo good to allow us to be apart of His arms stretched out to an incredible world of people that just need to know of His love!